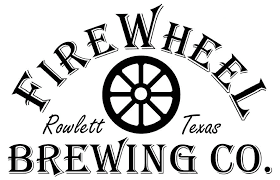 Image credit: FireWheel Brewning Co.
After more than three years in business, FireWheel Brewing Co. has closed its doors in Rowlett. The work of owner and brewer, Brad Perkinson, FireWheel opened in the summer of 2012 in a business park located on Lawing Lane. Perkinson ran the brewery as a proverbial one-man band during the company's first two years, not hiring his first employee until April 2014. Not long after that, he took on an equity partner with the intent to transition to a larger facility on Enterprise Drive. The new space, which featured a 30-barrel brewhouse, added cold-storage capacity and a taproom for visitors, debuted the following December. Entering 2015, Perkinson's long-term plan was to begin packaging FireWheel's products in cans, but financial issues got in the way and eventually forced him to announce the brewery's closure. After a final farewell party, FireWheel ceased operations on November 15, 2015.